In September I started hula hoop classes. These are held at the Easton Community Centre every Monday night. Its really lovely to meet with a lovely bunch of girls every week to teach hoop. Everyone has made such amazing improvement. Click the botton to access the facebook page. I am now a resident performer for Swing N Tings nights in Bristol. 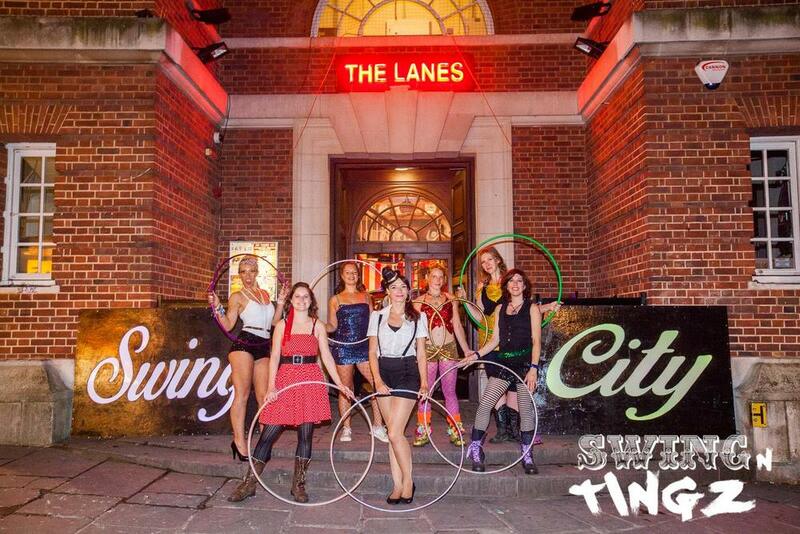 Every month myself and Rose Rokoko, bring fun and frolics to the Lanes, with intriguing walkabout performances, fans and hula hoop shows. Over the last few months we have been Sweet and Salt the Popcorn Girls, trying to break into show business. Gangster Animals, pedaling glitter in an age of prohibition and Dapper Chappers, confused by the modern age of clubbing. Come down to the Lanes to jump to hip-hop and electro swing, with myself, Tremor Sondsystem and Rose Rococo Walkabouts. Dapper Chappers, Swing N Tings, the Lanes, Bristol. I had a fantastic day hula hooping in the St Pauls carnival paraded. Seemed like everyone in Bristol had come to watch the show and to enjoy the food and music. The sun was hot, luckily we had a caddy to carry water along side us. The group who hula hoop in the paraded each year are Hooping Mad, a community group from Bristol, anyone is welcome to join, and we had a varied group of girls, from the young, the old and the pregnant, all dressed in their finest, fluffiest animal outfits. Roll on St Pauls carnival 2014. Today the lovely Elly and myself hula hooped 5 km in the Race for Life. The sun was baking hot and after 2 ks we really felt like giving up. Our sheer determination took us through to 4 ks but the rest is a bit blurry. At the finish line, hot sweaty and out of breath, Hart Radio interviewed us. The atmosphere at the event was positive. Everybody had a smile on their face and I raised £180.00 for cancer research. The next Race for Life is on the 6th of July. Visit http://raceforlife.cancerresearchuk.org/ to get involved.